You've played twenty questions before, right? You're given 20 yes/no questions with which to work out what another player is thinking of. Well, now neuroscientists at the University of Washington have developed a direct brain-to-brain connection that lets two people play twenty questions by transmitting signals from one brain to another over the internet. It works like this. 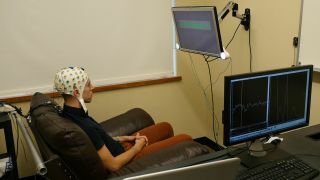 One player is equipped with an EEG cap that monitors electrical brain activity, and is shown an object on a screen. A second player sees a list of possible objects and questions associated with them, and can click one to ask it. The first player then answers yes or no by focusing on one of two flashing LEDs, which sends a signal over the web to a magnetic coil behind the second player's head. If the answer is no, nothing happens. But a yes answer generates an intense-enough response to stimulate the second player's visual cortex and they see a brief flash of light. Tests using the setup were carried out in dark rooms located about a mile apart, involving five pairs of participants who each played 20 rounds. Ten were real games, and ten were control games where there was no transmission of information. In the real games, players guessed the correct object 72 percent of the time, compared to just 18 percent of the control rounds. "This is the most complex brain-to-brain experiment, I think, that's been done to date in humans," said Andrea Stocco, the lead author of a paper describing the experiment. "It uses conscious experiences through signals that are experienced visually, and it requires two people to collaborate." Down the line, it's hoped that similar technology could be used to transmit brain states from one person to another - for example, sending signals from an alert person to a sleepy one. "Evolution has spent a colossal amount of time to find ways for us and other animals to take information out of our brains and communicate it to other animals in the forms of behavior, speech and so on," Stocco said. "But it requires a translation. We can only communicate part of whatever our brain processes," he added. "What we are doing is kind of reversing the process a step at a time by opening up this box and taking signals from the brain and with minimal translation, putting them back in another person's brain."